Our classic fit swim shorts are crafted from a quick-drying fabric which has been pre-washed for a supersoft finish. Beach to bar is effortless, meaning you can get on with your holiday in comfort. For a stylish holiday essential, our Tropez 5 navy trunk features a repeated geometric print that's based on the Californian sun setting over the coast. Designed for a more relaxed fit, our classic style swimming trunk has a fully elasticated waistband and drawstring tie for the perfect fit. 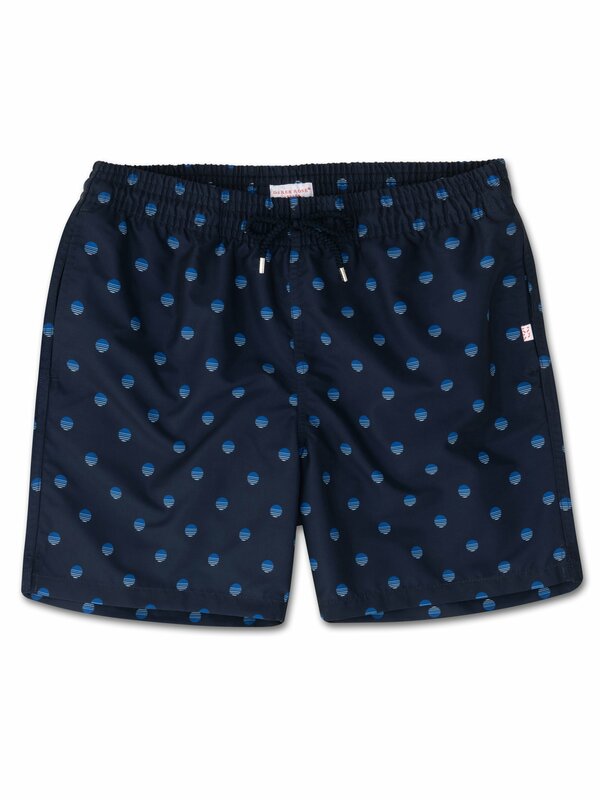 The braided drawstring ends are complemented with metal aglets for a luxe finish and the back of the swim shorts feature matching metal eyelets for easy air and water drainage.